For a lot of people it’s been a long, hard wait, but finally the Bluff oyster season is here. Oystermen set sail early on Saturday morning, hauling in thousands of the sought-after delicacy, with the first boat back in port before 8am. Some of the first oysters were sent to Christchurch Casino on Saturday morning, while an Auckland restaurant also took an early delivery. One of the first to get his hands on the salty treats in Invercargill was former Southlander Wray Horton, who bought oysters on Saturday and again yesterday, enjoying them cooked and raw. Customer Brian Haldane, buying some fresh oysters yesterday, said for about 40 years he had bought oysters at the beginning of the season for a Sunday cook-up. 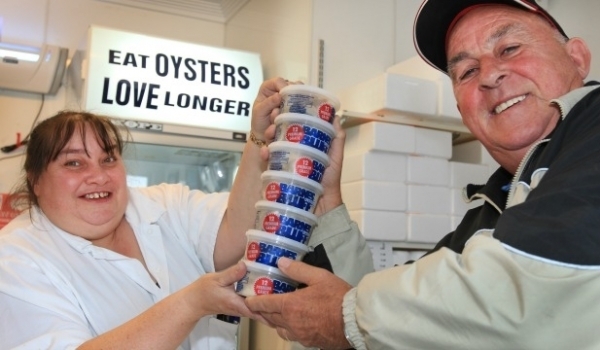 Bluff Oyster Management company spokesman and Barnes Oysters manager Graeme Wright said the first day of the season had been hectic and demand was strong. Saturday’s weather was marginal but the catch was good, with the 11 boats bringing in about 144,000 oysters, 12 thousand dozen. Mr Wright’s shop sold more 24,000 oysters on Saturday and at times the shop was jam-packed, he said. The first of the season’s oysters were a mixed bag in terms of quality, but he sampled a couple on Saturday morning and said they “certainly tasted lovely. Very nice”. Early indications were that the stock was healthy and predicted a repeat of the “fantastic” 2013 season when 13.2 million oysters were harvested. Pre-season sampling carried out in conjunction with Niwa (National Institute of Water and Atmospheric Research) and the Ministry for Primary Industries was looking promising. Prices at Barnes Oysters were the same as last year, with the factory’s retail shop in Invercargill charging $23 a dozen. The season ends on August 31.